Have aliens visited Earth? Take a look at these 10 bizarre sites found by alien hunters on Google Maps and judge for yourself. Whether you believe in aliens or not, you can’t deny that these areas found on Google Maps look a bit strange. In April, UFO hunters claimed a 500-metre-long object off the coast of Antarctica as an underwater alien lair. The website, UFO Sightings Hotspot, believes it does not fit the normal iceberg description. “I’m not an iceberg expert but this object is really peculiar and looks like a vessel disguised as an iceberg,” the site reads. There’s a Kofun Era tomb in Japan which looks identical to a mound on Mars from above. Alien hunters spotted the pair on Google Maps and Google Earth’s Mars feature respectively, and believe it’s evidence that Martians settled on Earth hundreds of years ago after a terrible event forced them off the Red Planet. They do look similar. But could it just be a coincidence? Google Earth: Select the planets icon, choose Mars and search 6° 3’57.07″N 92° 4’13.22″E. Could this giant pyramid shape spotted beneath the surface of the Pacific Ocean be an alien underwater base? That’s what Argentine researcher Marcelo Igazusta believes, claiming the object measures more than 8.5 miles across its base. Read more here. One eagle-eyed user noticed what looks like a spaceship parked – but not very discretely hidden – in Romania. After years of speculation, it eventually emerged that it’s actually a water tower built during the last century. No sign of alien life forms here then, but an easy mistake to make. Alien-hunting site UFO Sightings Daily claims to have found the entrance to an alien base in Argentina, which comes in the form of a floating island. It’s believed that the large, circular shape rotates in a circle and is large enough to allow a 100-metre UFO through. Could this be a crashed flying saucer? YouTube users secureteam10 spotted the strange object in a restricted area of Arizona – which only makes it even more curious. Not everyone is convinced, of course – some say it could just be a yurt. Russian UFO-enthusiast Valentin Degterev believes he has found the crash site of an alien craft located in Antarctica. A strange dent can be seen in the snow – what do you think? The South Pole appears to be a hive of extra-terrestrial activity, and YouTube channel Secure Team has suggested that this circle is a flying saucer. In the remote British territory of South Georgia, 810 miles from the Falklands Islands, a strange site has been found on Google Maps. 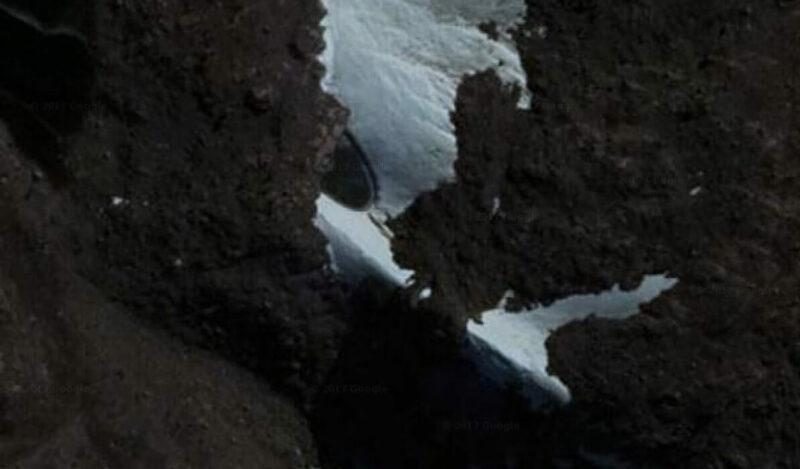 According to alien hunter SecureTeam10, the object and the lines leading up to it are all signs of an UFO crash landing as the vehicle “came to a screeching halt in the snow”. Alien activity or glacial movement? You decide. Alien-hunting YouTube channel sectureteam10 have spotted something on Google Earth. There’s a cloud formation that stretches from Antartica across the planet to the North Pole. While the UFO fanatics suspect something sinister is afoot, it could also be due to a glitch in Google Earth uploads.